Greetings again from the darkness. Apprehension and trepidation are the emotions that strike whenever anyone compares a movie to the classic 1973 Hal Ashby/ Jack Nicholson film THE LAST DETAIL. That holds true even if the novel the film is based on was written by the same author (Darryl Ponicsan) who wrote “The Last Detail” (1970), and even if the new film is directed by one of the finest directors working today – Richard Linklater. This latest doesn’t play like a true sequel, but the reuniting of three men who served together in Vietnam does hammer home a couple of interesting statements while also delivering the type of dramedy that 2017 audiences tend to connect with. Larry “Doc” Shepherd (Steve Carell), a former Navy medic, has had the type of year that no one deserves. It’s 2003 and he has just been notified that his Marine son was killed in action while on duty in the war in Iraq. This comes only a few months after Doc lost his beloved wife to breast cancer. It’s too much for him to handle on his own, so he embarks on a mission to ask his Vietnam buddies from three decades prior to accompany him to claim his son’s body at Arlington National Cemetery. His two buddies are former Marines Sal Nealon (Bryan Cranston) and Richard Mueller (Laurence Fishbourne). Sal is a washed out dive bar owner and Mueller is now the Reverend at a small church. The three men share the burden of a war secret that each has tried to forget, and they begin what’s basically a road trip movie of middle aged men bonding during what is the absolute low point in life for one of them. Simultaneously, it also seems like an opportunity for all three to rejoin the living. Mr. Cranston has the showiest role, but it’s Mr. Carell who shines as the still-in-shock father. J Quinton Johnson also excels as the young Marine charged with accompanying the gentlemen, and the best scene of the film features Cicely Tyson as the mother of a long ago fallen soldier who crossed paths with the three leads. As you might expect in a Linklater movie, the musical choices are unusual and spot on. Bob Dylan (“Not Dark Yet”), Neil Young (“Old Man”), Eminem (“Without Me”), and Levon Helm (“Wide River to Cross”) are all included. The film is certainly an unusual blend of comedy, tragic drama, and contemporary political commentary. Unfortunately, the contrivances are too many and too frequent to allow the film and characters to breathe and achieve the greatness of a true message movie. It teases us with flashes us brilliance and then pokes us in the ribs with another goofy sidebar as if to say “just kidding”. 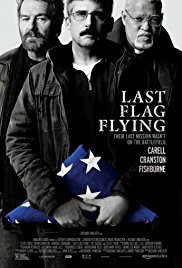 It seems this would have been better served as an intimate portrayal of these three aging men who were willing to die for their country than as a giant political anti-war statement and an accusation of how evil the government is. The ultimate message Linklater drills home: be a good friend, and be a good person. We can never have enough of those. This entry was posted on Wednesday, November 8th, 2017 at 11:43 pm and is filed under Comedy, Drama. You can follow any responses to this entry through the RSS 2.0 feed. You can leave a response, or trackback from your own site. Although my list of favorite movies fluctuates based on mood, “The Last Detail” is always near the top. Thanks Katrina!